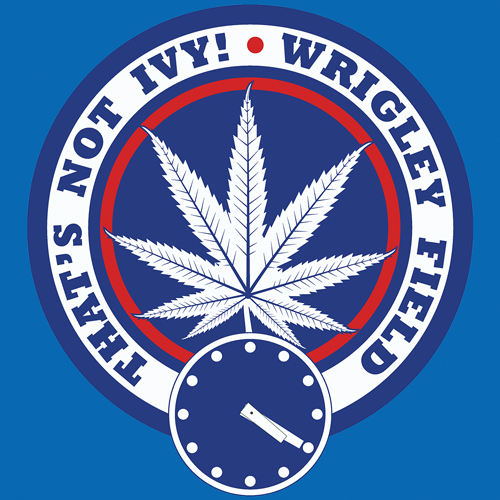 We have written in the past about Cubs fans and their appreciation for Marijuana. It’s possibly clear now more than ever before; show me a guy who bleeds Cubbie blue, and I’ll show you a guy who has ‘tried it’. Make sure you buy two tickets (only $7), and when you get up put on some long socks (I’ll explain both later). Next, grab some lunch, then hit up CVS. You probably just spent some money on weed, so do yourself a favor and don’t get snacks that cost $7.50 at Wrigley. I don’t think I have to tell you that smoking without snacks is like trying to pitch with your eyes closed: You can do it, but it doesn’t make any sense. Some personal favorites are Starbursts, Sour Patch Kids and, of course, Skittles. “I hate Skittles,” said nobody ever. Seriously though, have you ever offered somebody some Skittles who said no? If you know somebody who has, he or she is probably that friend who nobody really likes. This guy is SO baked while writing this. But it gets better. Still, refrain from smoking in traffic-heavy areas. This isn’t Colorado. I recommend hopping on the Purple Line to Howard then switching over to the Red Line. Get off at Sheridan and go a block south and two blocks east to Gill Park. If it’s too crowded just go a couple more blocks east, where plenty of lakeside fields are just begging for college kids to come light up in them. Once you’ve gotten your fix, pop on those gameday sunglasses (helpful for both glare and redeye protection), put any extra cigarettes in one of your socks (easily the best place to hide a joint) and head over to the ballpark! All aboard! We are stoned, and heading to Wrigley! Now, if you have managed your time well, you should have some time for another quick snack before heading into Wrigley. The two most obvious destinations are McDonald’s on North Clark St. and Taco Bell on West Addison St. Both are about a minute’s walk from the front gate of Wrigley. Personally, I think of Taco Bell as drunk food more than high food. Plus, the Dees has McFlurries and McNuggets, basically a meal from a five-star restaurant when you are baked. Once you get in line for a pat-down before entering the game, stay calm and try not to get paranoid. Remember, they don’t know you’re high even if you think everybody can tell. They can’t. Hopefully the game has a lot of offense. Unless you are an avid baseball fan, a slow-moving game or a pitcher’s duel can get dry quickly. Even if the game lets you down, there are still plenty of things to keep a stoned kid entertained at a baseball game. A true baseball fan loves a pitching duel, but a Wrigleyville puffer loves a slugfest! The last time I went to Wrigley was two or three years ago, so I don’t remember the exact games they put on the big screen, but every stadium has them. You know, those mini-games where a banana, orange and apple race and the crowd is supposed to guess who will win. At Yankee Stadium, it’s always a subway race. And even though the game is predetermined before you select the winner, you always feel like a boss when you guessing correctly. Take a look through the program and see which players you’d like to smoke a joint with and why. Sounds stupid, but a lot of stupid things aren’t so stupid when you are stupid. Before you furrow your brow and say ‘what’ at the last sentence of Mr. Wrigley 4/20, it actually makes a lot of sense (in the eyes of a stoner) if you go back and read it again. If you are a gambling man or woman, try making some bets on really obscure things. For example, friends and I always used to bet on whether the ball would land on the mound or roll off when the pitcher, catcher, etc. rolled the ball toward the mound at the end of each inning. Be ready for some T-shirt tosses. Fact: Winning things are just better when you’re high. You know those numbers you can text mid-game to get a message on the big screen? Have a little fun. Try and incorporate some subtle 4/20 jokes. That ball toward the mound game is so much fun without being stoned! You have to find the right balance of school spirit and weed references. Trust me, I used to spend whole Yankees games trashing Joe Buck up on the big screen, even when he wasn’t calling the game. Now this just sounds dull even if you’re high. He goes on to tell you how to finish off the night (high of course), including which train to ride back to Northwestern. There are so many references and connections to Cubs fans and their green out there on the internet. I don’t know what this conjunction exactly spawns from; but it’s very real. We’ll report back with more later in the year when another Cub or Joe Pepitone has given us more material. Cubs fans and their adoration for pot is something to marvel at!